Protect your citizens, schools and critical infrastructure by enabling faster, better and more informed decision-making. 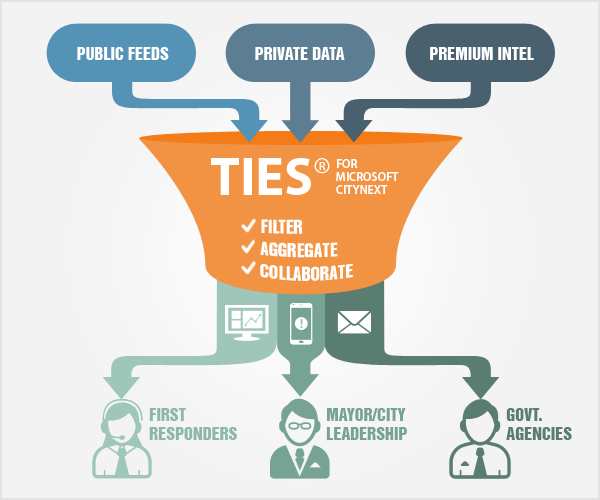 TIES for Microsoft CityNext is an intelligence sharing platform designed to support critical security initiatives for your city. Combine and filter your private data with a wide variety of public feeds including public safety, public health, severe weather, natural disasters, transportation disruptions, terrorism, and more. Enable city, county, and state leaders to act quickly and strategically by sharing relevant Smart Alerts and rapidly deployed Dashboards within and across agencies using TIES’ Communities of Trust model. Empower city leaders to make better informed decisions with a wide scope of intelligence regarding public safety, public transportation, severe weather, natural disasters, energy disruptions, and more. School administrators can get a complete picture of their students, staff, campus and surrounding community with a common operating picture that incorporates nearby 911 incidents, severe weather, live video feeds, relevant news headlines and social media. Get a 360˚ view of any major production—from conventions and summits to concerts and playoff games—with local traffic alerts, public transportation delays, social media monitoring, terrorist threats, and more. Connect relief agencies, government leaders and emergency responders with real-time alerts about natural disasters, severe weather, public safety, energy disruptions, humanitarian efforts, local crime, and more. Choose from an extensive collection of channels and dashboards providing late-breaking information on cyber attacks, privacy policies, vulnerabilities, malware, identity management, mobile hacking, information risk management, and more.